The aim of RECOVER: Reproducing Citizenship and National Identity in Syrian Refugee Camps is to describe if and where the loss of state membership has been most keenly felt by Syrian refugees, and the actions undertaken in order to regain its benefits. The project separates these benefits into two categories: the civic advantages of state membership, based on the benefits of institutional support and public services; and the social advantages, based on the appeal of belonging to a living community of shared culture and heritage. The project is based upon the researchers’ own experience of working with Syrian refugee communities in Lebanon, where refugees’ views and activities suggested a variety of attempts at reproducing the state left behind, and the ongoing conversation between “civic” and “ethnic” interpretations of group membership. Some community-based activities, like rallies and demonstrations, suggested nostalgia for state membership as a social experience based on shared traditions within an extended kinship. Other activities, however, such as the construction of civic institutions, indicated that the loss of state membership had been sharply felt as the loss of citizenship and the access it provided to state support and services. Nonetheless, international organizations continue to advocate both for greater inclusion of Syrian refugees within Lebanese state services, and for the official recognition of Syrian refugee camps and other facilities. Simultaneously, the Islamic State continues to present itself as a state unique throughout the world by its willingness to welcome new citizens and its ostensible ability to provide them with employment, healthcare, and education. Meanwhile, refugee studies literature emphasises the damage of the identity vacuum, where for those fleeing conflict citizenship becomes increasingly meaningless as they perceive their country both as one that abandoned them and one that they no longer recognise. Mishandled, each of these potential regenerations of state membership presents a catalyst for violence: recreating civic institutions for Syrians is deeply problematic in a host country that already accommodates a parallel Palestinian state, is still recovering from the effects of 15 years of civil war, and has not forgotten 29 years of Syrian occupation. At the same time, the Islamic State’s existential dependence upon committed violence is well-documented. The project aims to understand the varying significance of different community units – from the camp to the country – in respondents’ internal classification schemes of the world around them. Clarifying these perceptions will provide a better understanding of the position Syrian refugees find themselves in, setting the foundations for more informed aid and peacebuilding efforts. The project combines an ethnographic theoretical perspective with a phenomenological research method, or the assumption that cultural knowledge affects the way that people interpret their society with a method capable of accessing and mapping these interpretations. The selected method of in-depth, semi-structured interviews in Syrian refugee camps in Lebanon is a result of triangulating these two approaches. The researchers will take a theoretical sampling strategy, based on achieving an understanding of a particular social process, rather than obtaining a representative sample. Given the relatively small research group and the general homogeneity shared between participants, the research team of RECOVER expects to achieve a rich understanding of dislocated belonging within a small range of settings. 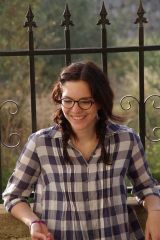 Annabelle Giger is a research and project manager for an international charity based in the UK. 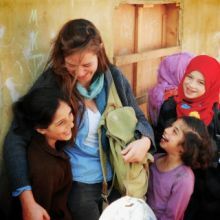 Prior to that she worked for six months in Lebanon as Education coordinator for a charity involved in education and peace building activities for Syrian and Lebanese children. Annabelle’s focus is on the impact of human rights violations documentation on conflict and peace processes. Her recent projects include a study of the transitional justice process in post-2011 Tunisia, and the documentation of violence in Nigeria. Annabelle holds an MPhil in International Relations from the University of Cambridge. Louise Vandenberghe holds a degree in Human Rights and Humanitarian Action from the Paris School of International Affairs (PSIA). She is currently working for the International Center for Policy Migration Development (ICMPD) as a Junior Expert. For the past few years, she has been in charge of implementing projects for various organizations focusing on refugee issues such as Amnesty International Israel, AJEM and Relief and Reconciliation for Syria. She has recently contributed to the completion of a study on migratory routes from West Africa to Morocco commissioned by the European Delegation in Morocco.